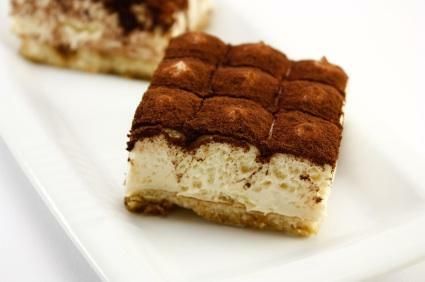 You may have decided to make a tiramisu, or have come across it in one of your Italian cookbooks, but what is Mascarpone cheese? A basic definition is that it really isn't a cheese at all, but rather a dairy product made from cow's cream that is creamy, with a spreadable consistency. It is a little bit like sour cream, but has more body like a cream cheese. Mascarpone cheese is made from cow's cream. Unlike other cheeses, it is not made with a starter or rennet and doesn't involve the cutting or separation of curds from the whey. It is a pale blond color, with a smooth, soft, sweet taste. The full flavors come from a high butterfat content of around 70-75 percent, which is the highest fat content a dairy product can be without becoming butter. Mascarpone is made by adding citric acid to heavy cream. The citric acid creates a climate where the cream gives up some of its moisture. After the acid is added to the cream, the mixture is drained through cheesecloth. The result is like an English clotted cream, or a thick crème fraîche. Some experts believe that Mascarpone got its name during the 16th century when a Spanish official said to its maker that it was mas que bueno, which means "better than good" in Spanish. Others think that the name came from a salty Ricotta made in the Italian alps called Mascherpin. Still others believe that the name comes from the Italian verb "mascherare", which means to "dress up" or "camouflage". Another well-known Italian dessert made with this cheese is zuccotto, a pound cake made with grappa (an Italian liquor) and Mascarpone that is shaped like a dome. In Lombardy, Mascarpone is widely celebrated, most notably in a dish called torta di mascarpone, where this cheese is layered with other ingredients, such as basil, and other cheeses like Gorgonzola dolce. Other versions include pine nuts, Parmesan, basil and olive oil, or torta de salmone affumicato, where the Mascarpone is layered with smoked salmon. When choosing a Mascarpone cheese make certain that it is sweet with a smooth texture. There shouldn't be any lumps in the cheese, and it shouldn't be salty or bitter. Mascarpone doesn't store well because it doesn't have a very high salt content, so when you purchase it, plan on using as much as possible as quickly as possible. If you purchase it to make a recipe and have some left over, simply use it as a condiment with berries, or add it to pasta sauces for a lovely rich flavor. It can be used in place of butter on muffins or bread or sprinkled with cocoa and cinnamon and enjoyed as a dessert. If you are using Mascarpone in a dessert, pair it with sweet dessert wines, such as Marsala, or a sweeter sparkling wine. They will help pick up the sweet notes of the cheese and will cut through the butterfat feel on the tongue. Making Mascarpone is a simple process. The end product will need to be consumed within a few days, however, so plan on eating it as soon as it is finished! Fill the bottom half of a double boiler so the water hits the top pan. Bring the water to a high simmer. Pour the cream into the top of the double boiler, add the powdered sugar and whisk. Place this mixture over the simmering water. After the cream has warmed, add the tartaric acid. Continually whisking, heat the cream until it reaches 180 degrees F.
Finally, remove from the heat and pour the cream into a bowl lined with thick cheesecloth. Tie the ends of the cheesecloth together and set the cream to drain. Cover the bowl with plastic wrap and place it in the refrigerator for about 12 hours, or until the Mascarpone is thick and of a spreadable consistency.